Wilfrid Laurier University and Aramark, the food operator that manages all food services on campus aside from Wilf’s and Veritas, appear to have a deal in sight in their recent negotiations. According to Dan Dawson, the associate vice-president: student services at Laurier, negotiations have been occurring this past year to strike a five-year contract – retroactively beginning last September – to accommodate the recent acquisition of the Terrace from the Wilfrid Laurier University Students’ Union and the changes made to the dining hall. Dawson hopes that negotiations will be completed before the fall when students arrive, and anticipates it “doesn’t really have a lot of direct impact on operations” since they will be following the same model from 2012-13. The hope, however, was to originally have everything finalized by July. “I would say that we’re very close to finalizing all the terms. As you can imagine, it’s been complicated by the standpoint that we have three organizations migrating two contracts into one,” explained Dawson, noting that the contract the Students’ Union had with Aramark is different than Laurier’s. The goal now is to centralize the contract throughout most of the food services on campus, but without removing many of the specifics of the contract that WLUSU had with Aramark when they passed over the operation in 2011. Once the contract is finalized, finances, employment, hours of operations and marketing will all be centralized under an individual Aramark management team. Even with the Terrace under Aramark in 2012-13, the operation was still run under an independent management team separate to the one that manages the dining hall. 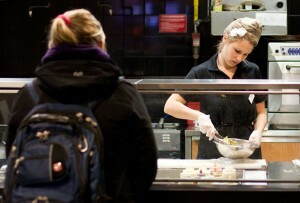 However, the Students’ Union has been involved in the negotiations to ensure that some of the concerns they’ve heard from students are addressed by Aramark, specifically in relation to the controversial new meal plan and structure associated with the dining hall as well as student employment on campus. “A lot of it stems from student concerns about accessibility and flexibility to the dining hall,” explained Annie Constantinescu, the president and CEO of the Students’ Union. For example, a recent petition on Change.org has been circulating on social media about the dining hall and its prices. In addition, it is the only food operation open at 7 a.m., and charges $8 for an “all-you-care- to-eat” breakfast. Constantinescu mentioned that they’re trying to convey these concerns to Aramark. “It’s very tricky because they are more or less looking out for what’s best for their business. But it’s been tough, I think that it’s difficult for them to put themselves in the shoes of a student,” she added. In terms of student employment, Constantinescu said that she hopes to see more opportunities for students, but that it is completely in the control of Aramark. “They do allocate [employment] for students, [but] that is actually one of those things that we’d like to see more of,” continued Constantinescu. But both Dawson and Constantinescu remain optimistic that negotiations will be completed on time before the fall begins. Dawson noted that the three parties – WLUSU, Laurier and Aramark – are planning on meeting within the next couple of weeks. “It’s just us moving into that sweet spot and really just finding that perfect balance for the students, the business and the university as well,” Constantinescu said.